EMSB’S TOP SUCCESS RATE: For the third year in a row the EMSB has the highest Success Rate in the entire province of Quebec among public school boards, figures released by The Ministère de l’Education et de l'Enseignement supérieur (MEES) show. The 89.4 percent figure is based on a seven year cohort. It combines the high school graduation rate during that time period with the certification rate of students in the Work Orientation Training Pathway (WOTP). It followed the progression of students from 2008 to their graduating year in 2015 and represents an improvement from last year’s total of 87.9 percent. In its Partnership Agreement with the Ministry, the EMSB had a goal of 86 percent for the graduating class of 2016 and 88 percent for 2020. “We have surpassed that target and our 2020 objective,” EMSB Director of Educational and Technology Services Sandra Furfaro said with pride. To put the EMSB’s present student Success Rates in full perspective, the average Success Rate among all Quebec schools (public and private) is 78.8 percent while it stands at 74.9 percent for public schools only. OUTSTANDING PRINCIPAL: Anna Sanalitro, the principal of the EMSB’s Pierre Elliott Trudeau Elementary School in Rosemont, is one of two Quebecers to have been selected as one of The Learning Partnership’s Canada’s Outstanding Principals™ Now celebrating its 13th year, The Learning Partnership’s Canada’s Outstanding Principals program recognizes the unique and vital contribution of principals in publicly funded schools. The 40 principals, nominated by parents, colleagues, and community members, and chosen by a national selection committee, are being celebrated for demonstrating innovation, leadership and for employing creativity in finding solutions and opportunities within their school communities. They will be awarded for their accomplishments at the annual Canada’s Outstanding Principals gala on February 28 at the Sheraton Centre Toronto Hotel. The other Quebecer is Mary Lazaris, Principal of Twin Oaks Elementary School in Laval. Anna Sanalitro has been a teacher, mathematics consultant, and administrator at both the elementary and secondary school levels. In 2014, she became the Principal at Pierre Elliott Trudeau, a school with diverse student needs. She began by engaging all stakeholders to provide input and participate in the change process and used her expertise to focus on STEAM (Science, Technology, Engineering, the Arts and Mathematics) program. She upgraded the school’s technology, removed barriers to collaboration, and created two classrooms focusing on social, emotional and educational development. Supports are also in place to maximize learning opportunities for students with special needs. Ms. Sanalitro introduced acceleration as an approach to support underachieving students, and encouraged the use of an outdoor classroom to provide authentic learning experiences, supported by community volunteers. Not surprisingly, enrollment and achievement have increased under her leadership. See the full press release. MORE ON STEAM: Last month’s launch of the EMSB STEAM (Science, Technology, Engineering, Arts and Mathematics) initiative has attracted a lot of positive media attention. Click on the links below. Some B.A.S.E. students at General Vanier. B.A.S.E. AND STEAM: The B.A.S.E. (Before and After School Enriched) Daycare Program complements the educational project of a school. Therefore, when a school deems itself as a STEAM school, then the B.A.S.E. 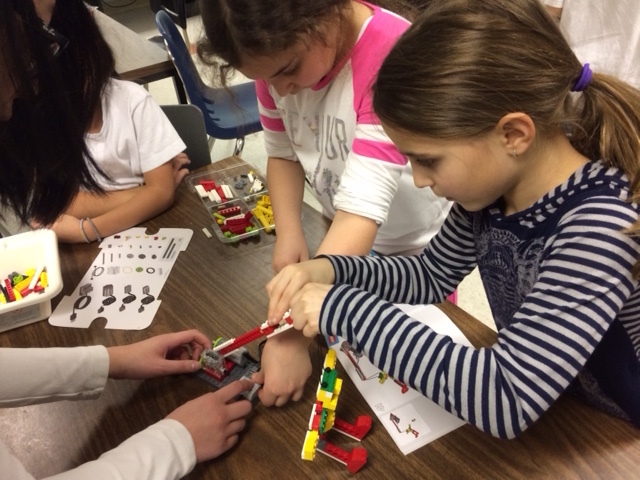 Program at that school will offer extracurricular activities to its students Sara Iatauro, Elementary Science, Technology and Robotics Consultant for the EMSB to provide workshops to General Vanier B.A.S.E. Daycare educators on the Lego We Do program in December 2016. Since then, daycare students of all ages have been participating in the daycare Robotics program on a weekly basis and on pedagogical days. Annakin Slayd at Royal Wesr Academy. BLACK HISTORY MONTH: To mark Black History Month in February at the EMSB, rapper Annakin Slayd facilitated a series of sessions on baseball legend Jackie Robinson and Montreal at a Andrew Farrar, who grew up in Chomedey and graduated from Western Laval High School in 1995. In 2011 he worked with the Quebec English School Boards Association on their “Go Publique” marketing campaign, producing, directing and starring in a music video aimed at boosting enrolment. 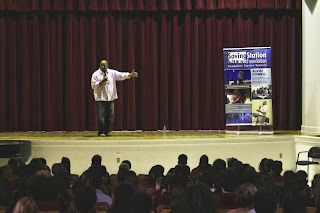 At each school Slayd made a three-part presentation of about 50 minutes highlighted by a screening of the PBS Mountainview piece “Jackie Robinson’s Montreal Connection” and his hit video with singer Leesa Mackey. Using pictures and video about Jackie Robinson and his accomplishments in the world of baseball and through the Civil rights Movement, Slayd expanded with an examination of his time in Montreal and the legacy that has endured in our city, as well as how the tradition of embracing other athletes considered outcasts such as John Carlos and Michael Sam is recognized around the sports world. Schools visited were St. Laurent Adult Education Centre, Cedar crest, Parkdale, Dalkeith, John F. Kennedy High School, Royal West Academy and LaurenHill Academy. He is now taking bookings for April. Click here for more information. See the reports on CBC TV and CTV Montreal . MORE ACTIVITIES: Schools across the EMSB network marked Black History Month with some other unique presentations. 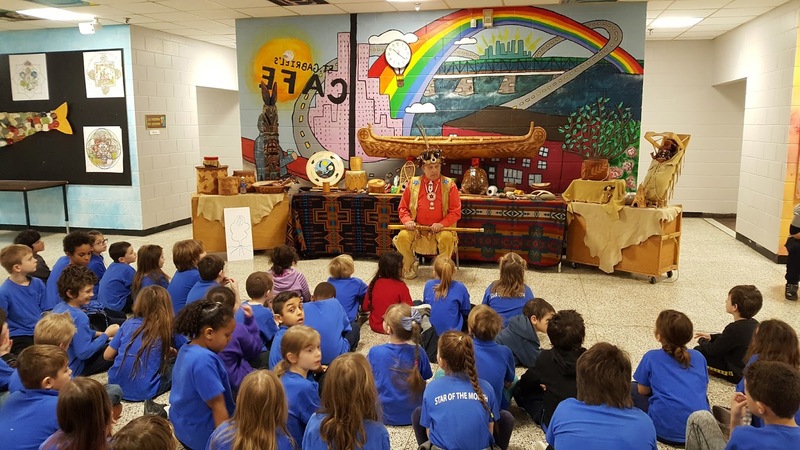 St. Gabriel Elementary School in Pointe St. Charles, as well as St. Monica and Royal Vale Elementary schools in N.D.G., welcomed Gotta Lago. Born in the Ivory Coast, Gotta Lago presented the history of music in West Africa. He explained how his society is divided into caste occupations, including the griots, who were carriers of oral culture, including music. The students learned about the various instruments including the djembe, as well as traditional African singing and dancing. Additionally, James Lyng High School in St. Henri and Royal Vale High School in N.D.G. both welcomed back Overture with the Arts. To celebrate Canada’s 150th anniversary, OWTA created a presentation called Slam Obsidian: An Exploration of Influential Black Canadians that marks the contributions of African Canadians over the course of Canada’s 150 years of confederation. Guest speaker Omari Newton gave an interactive presentation that addresses the important role that African Canadians have played in weaving a rich fabric of Black History worldwide. Members of the service are recognized at the Council meeting. ANIMATORS HONOURED: EMSB Director of Student Services Lew Lewis recognized the Spiritual and Community Animation Service at the start of the last Council meeting. The Canadian Race Relations Foundation recently recognized the service for its ongoing efforts to foster racial harmony, cross-cultural understanding and eliminate racism. Healthy Schools Consultant David Roger Gagnon (second from the left) is thanked for nominating the service. The honour was bestowed upon the Spiritual and Community Animation Service at the Canadian Race Relations Foundation conference in Toronto. EMSB Chairman Angela Mancini lauded the team of animators. Mr. Lewis recognized retired Assistant Director of Student Services Dora Cesta for her role in launching this service. DREAM BIG: Cycle 3 students at Dalkeith Elementary School in Anjou will be launching a new program entitled “DREAM BIG!” It is inspired by the achievements and contributions of the Black community to Canadian society. The program will be overseen by Spiritual Community Animator Vince Lacroce and Cycle 3 teacher Patty Vlahakis. The students will discuss the importance of unity, social justice, cultural diversity and perseverance. Mr. Lacroce will be conducting interactive workshops on the importance of everyday heroes and the progress of the civil rights movement. The students will then create a short film where they share their dreams and aspirations for the world. The film will be put together and unveiled at the end of the month. Students gather around Ross Paperman. CARTOONS AND RHYMES: The Cycle 3 students at Dalkeith were treated to an engaging day of cartoons and rhymes. Ross Paperman, the artist who graduated from the Ontario College of Art, entertained the students with delightful cartoons and the amazing ability to rhyme. The man with the Paperman and Sons, Montreal's pre-eminent Jewish funeral parlour, was founded more than 100 years ago by Ross' great-grandfather, Lazar Paperman. Ross Paperman deals with sadness every day, but he is able to bring great joy with his drawings and personality. Ross ended the day at Dalkeith by showing the students how to create their very own moving caricatures. A big thank you for a day the students will not soon forget. Courtney Sculnik, a special education consultant, organized the visit. heart of an artist: funny, whimsical, perceptive and emotional is not actually an artist. Rather he runs a Jewish funeral home with the help of his family. 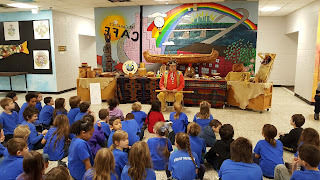 Chief Top Leaf talks to students. Enjoying the fun at Foyer Dante. 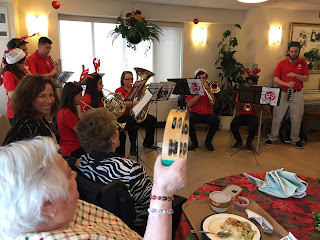 of this intergenerational project was to promote the virtue of love and compassion for those in our community. Over 50 students took up the cause and fundraised for new stuffed animals, Valentine’s Day cards, chocolates and other gifts to be distributed to seniors at Centre D'Accueil Dante. All extra gifts collected will be donated to the Montreal Autism Center. 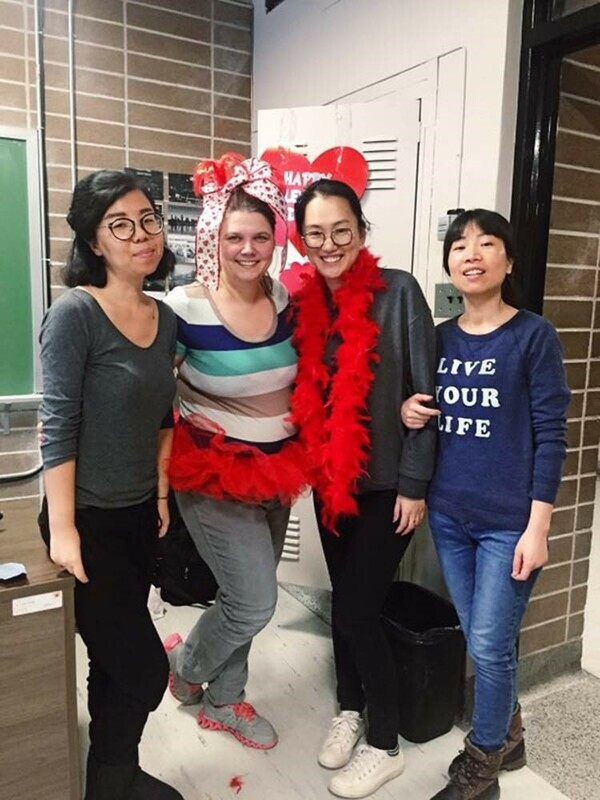 Students were encouraged to raise funds for the gift collection by organizing themselves into teams of five and coming up with different activities that will encourage their fellow students and community to donate. The top three teams that generated the most money had the opportunity to go to the residence and personally hand out the donated gifts, enjoy a holiday luncheon and take a photo with the residents in a Valentine’s Day Photo booth. BRAVE: The message of leading a healthy lifestyle will resonate throughout the halls of Rosemount High School this spring through a new program entitled B.R.A.V.E. The Balance, Acceptance, Loyalty, Assertiveness and Eating Habits/Exercise program will incorporate nutritional workshops, games, exercises, activities and meditations all meant to serve as a complement to the school’s Spirit Retreats. The program is being organized by EMSB Dietitian Giuliana Di Quinzio and Mr. Lacroce. DANGERS OF SUBSTANCE ABUSE: On February 14, Rosemount High School welcomed ex-NFL Player Alvin Powell to speak on the dangers of substance abuse. Powell, who played for the Seattle Seahawks and Miami Dolphins, shared his background, beginning with his childhood, his rise through the ranks of professional football, and eventually his struggle with drugs like marijuana, cocaine and alcohol that caused his life to spiral out of control. 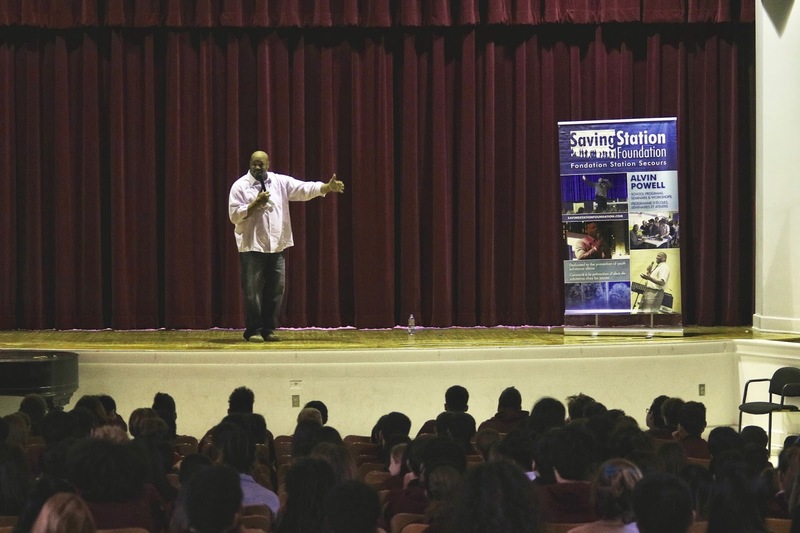 The session reached its climax when Saving Station Foundation, a Montreal-based charity dedicated to the prevention and education of substance abuse. Students and guests gather at Interfaith event. INTERFAITH EVENT: Students at Rosemount High School participated in an inter-faith workshop on February 21 and took the opportunity to discuss the importance of unity and togetherness with representatives from the Christian, Jewish and Islamic faiths. The idea for the workshop came as a result of the recent tragedy in Quebec City, which prompted many discussions in the school. Organized by Spiritual and Community Animator Vince Lacroce, students met with Father Gerald Westphal, former EMSB Spiritual and Community Animator and Priest at Saint-Boniface Church; Rabbi Avi Finegold from the Jewish Learning Lab; and Noor Jehan Ghauri, Social Activist for the Islamic Centre of Quebec. In addition to hearing about the respective religions, the students and spiritual leaders will discuss how to build bridges between communities and how to promote peace through education. PINK SHIRT DAY: Vincent Massey Collegiate in Rosemount marked its fifth Pink Shirt Day on Friday, February 17. On Pink Shirt Day everyone is encouraged to wear something pink to show that efforts are being made to prevent bullying in schools. The tradition at VMC first began in 2012.Guest speaker Wali Shah, selected as one of Canada's Top 20 under 20 in 2014, and is a highly acclaimed Canadian speaker and poet. He is also currently a student at the University of Toronto and combines social issues, experiences, comedy, and his South Asian and Muslim background to bring his work to life. The student population and staff were provided with a pink t-shirt designed by students. The theme this year is ‘Pink it forward.’” See some of their students here on Global TV. VMC is pretty in pink. A Parkdale student and his Post It. For the second consecutive year, Nesbitt Elementary School participated and educated its students on the importance of empathy, solidarity and support for all those who have been victimized in an act of bullying on Wednesday, February 22. This day-long celebration was spearheaded by the Principal Antoinette Scrocca and Mr. Lacroce. Rosemount High School staff and student banded together for a month long program called "Speak Out!" intended to educate students through empathy workshops and programs to decrease levels of bullying and aggression inside and outside of school. In the weeks leading up to Pink Shirt Day on February 22, leadership students at RHS posted colorful Post-It notes filled with inspiring quotes and words of wisdom on the lockers and mirrors of the school washrooms. The intent of these daily affirmations was to inspire students to be accepting of themselves and of others. As part of Pink Shirt Day, Parkdale Elementary got a little brighterafter hundreds of neon Post-it notes with inspiring messages started popping up all over the students lockers. See our full press release for more. HEALTHY BALANCED MEAL: With the help of Food Network chef Sergio Mattoscio, on February 13 students at Perspectives I High School learned how to prepare a healthy and balanced meal. Following the preparation of the meal, students and staff gathered to eat together, incorporating the importance of love and friendship. The gathering is meant to ensure that students understand that a meal is more than sustenance, but vital for the spirit as well. Students and staff with seniors at their session. 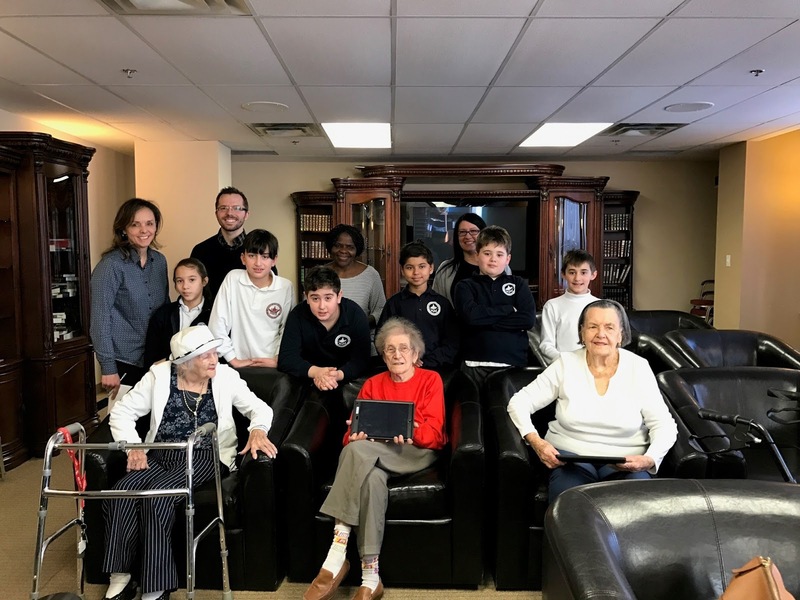 IPADS FOR SENIORS: With their iPads in tow, Grade 4 students from St. Dorothy Elementary School in St. Michel recently visited the senior residents of Maison Parc Jarry. Coordinated by Spiritual and Community Animator Aaron Durocher, Principal Sandra Léveillé and IT Coordinator Sherron Anglin, the students and seniors took turns interviewing each other about their first experiences with photography. The students filmed the interactions on iPads, and then taught the seniors how to use them. Positive relationships were developed and the students learned the value of showing empathy. They are looking forward to returning to the residence to present an edited video of their interviews in the near future. Here are some photos. 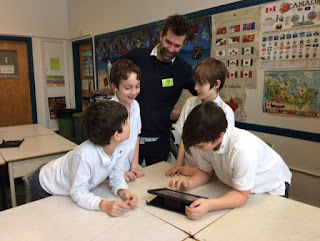 FABULOUS VIDEO: St. Dorothy School has submitted an Indigo Grant Application. One of the components of the grant was to make a video to demonstrate why its school library would need new books. It is a fabulous piece of work and can be viewed on their Facebook page. BANCROFT CENTENNIAL: Bancroft Elementary School in the Plateau officially marked its 100th anniversary with a gala cocktail evening on February 16 with performances and presentations by some of the teachers and students. While the school officially turned 100 in September 2015, a committee was only recently put together to mark the Centennial. Event Coordinator Vanessa Langevin, the parent of a Bancroft student, was pleased with the evening which included a fashion show by staff and students and a Bancroft historical display. In April 1911, the former Protestant School Board of Greater Montreal purchased a block of land on St. Urbain Street above Mount Royal Avenue with the expectation that within a few years it would be necessary to build a new school to relieve the overcrowding at two neighbouring schools - Fairmount and Mount Royal. During the 1913-14 academic year, the PSBGM decided to prepare for the construction of a large school of the first class on this site, and plans were prepared accordingly. Bancroft Elementary School opened in September 1915 and was named in memory of Rev. Charles Bancroft, the first chairman of the PSBGM from 1846 to 1848. The building contained 29 classrooms, two Kindergarten rooms, a cooking centre for girls, and a manual training (woodwork) centre for boys and a gymnasium which could also be used as an assembly hall for the school. Drs. Phil Gold and Mortimer Levy with former Principal Artemis Maravei. Bancroft opened at just the right time. Fairmont had 1,600 pupils and Mount Royal 2,000. When Bancroft did open it began life with an enrolment of 1,081 pupils in 26 classes drawn from the two schools- about 300 from Fairmount and 800 from Mount Royal. Principal Dorothy Ostrowicz points out that Bancroft is recognized as the “little school, with the big heart.” It presently has an enrolment of 270. That is a sharp rise from 2010, when the total number was 173. See the full press release. Here is a Montreal Gazette video. MARCH IS NUTRITION MONTH: March is Nutrition Month all across Canada and in celebrating this, Cafeteria and Nutrition Education Services of School Organization has prepared an array of nutrition activities. The campaign aims to promote healthy eating habits on a daily basis by promoting nutrition awareness and increasing nutrition knowledge. In elementary schools, celebrate Nutrition Month 2017 by taking the March to Health and completing fun and educational challenges related to different nutritional themes. If you participate, your class can accumulate points with each activity completed and can even win a culinary qorkshop! Furthermore, in-class activities which give students the tools to read and better understand nutrition labels are available all year-long in elementary schools as part of the “Read What You Eat” series. Animated by an EMSB dietitian, these activities are building blocks for our kindergarten to grade 6 students to increase nutrition knowledge and help them make healthy food choices. For more information about “Read What You Eat” activities and Nutrition Month 2017, please contact Emily Rose Hamilton-Leavitt at 514-483-7200 ext. 7368 or at ehamilton-leavitt@emsb.qc.ca. HIGH SCHOOL ACTIVITY: In high schools, the nutrition program entitled “EAT RIGHT FEEL BRIGHT” will take place in the form of in-class sessions geared towards secondary one and two students in Physical Education and Health classes. The aim is to encourage healthy lifestyles through good nutrition and physical activity and to sensitize students to the social influences on their perception of health and well-being. In high schools, the EMSB 2017 Nutrition Month Campaign is March to Health - Are You Ready to Challenge Yourself to Become a Healthier? To celebrate this event, high school teachers along with their students are invited to participate in educational activities and challenges to give students the knowledge and tools to make healthier food and beverage choices. For more information about “Eat Right – Feel Bright” activities and Nutrition Month 2017 in high schools, please contact Giuliana Di Quinzio at 514-483-7200 ext. 7287 or at gdiquinzio@emsb.qc.ca. LHA AT THE QUARTIER DES SPECTACLES: LaurenHill Academy in St. Laurent is among the high schools across the 19 boroughs of our city which will depict images of their future communities through technology and historical photographs. The created images, thoughts, and messages of tomorrow’s Montréal will be shared through social media and brought to light in an animated projection at Quartier des Spectacles. The students are engaged in a dialogue about our city in the past and the present, and then asked to imagine their own community in the future. Using tablets, Mr. Brochu’s media arts classes are using a drawing and collage platform to create these images, messages, and animations. Log on to https://www.up375.com. Meanwhile, LaurenHill A was also among the few schools approved for an educational and integrative project for Design375. Students will be involved in the various stages of an urban redevelopment project, from the idea phase to its execution. Mr. Bilodeau’s Contemporary World class will be able to create a living environment that reflects today's young Montrealers: innovative, inspiring and vibrant. This reimagined outdoor space will be the fruit of a unique collaboration between our students, design university students and industry professionals, RBC employees, local businesses and citizens from the neighborhood. Info: https://www.fusionjeunesse.org/design-375. 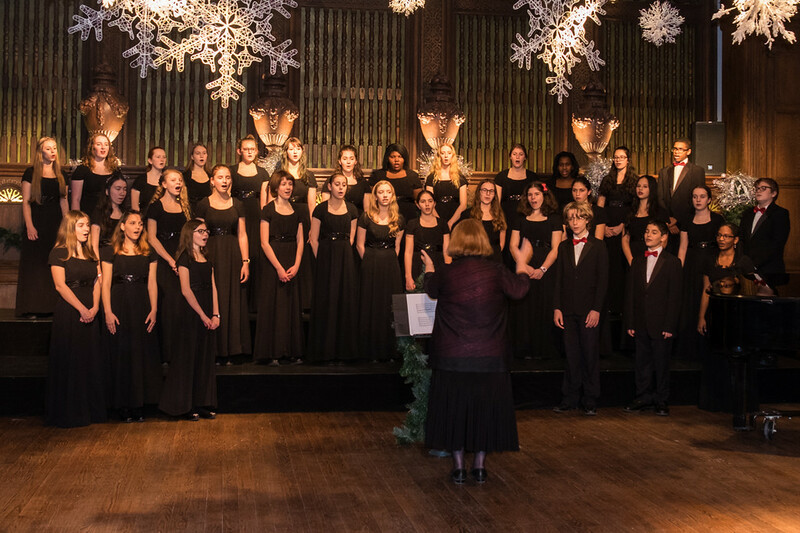 March 25: The Senior Chorale sings once again in the Earth Hour concert hosted by the Choeur des enfants de Montréal. This is a beautiful event performed by candlelight at Christ Church Cathedral downtown. April 21: The Senior Chorale joins forces with a visiting high school choir from Mountain Lakes, NJ, for a concert in the chapel at Notre-Dame Basilica. 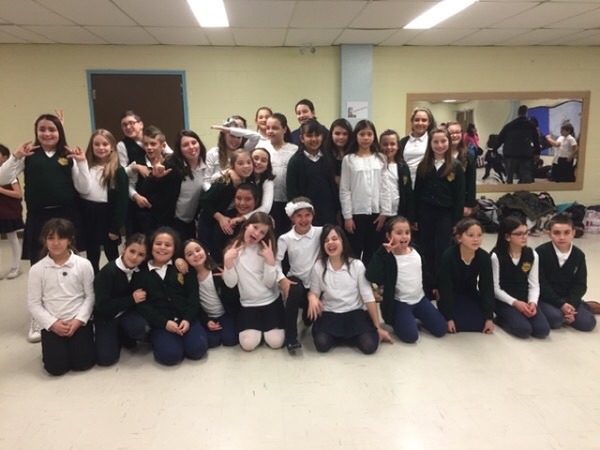 April 22: The Junior Chorale sings in the annual En harmonie for Kids benefit concert for Sun Youth. This festive event features several children’s and adult choirs, and the Con Brio Wind Band from FACE. May 6: The chorale’s annual Spring Gala Concert at Oscar Peterson Hall. This will be an all-Canadian program featuring a new work by Montreal composer David Désilets, and music in honour of the Vimy Centenary. DIGITAL CITIZENSHIP: Under the guidance of EMSB IT consultant François Dupraz, Grade 5 Royal Vale students explored the concept of digital citizenship. They discussed what it means to be both a citizen and a digital citizen. They talked about the importance of being "real, safe and smart"
François Dupraz works with students. when online. As explained further on the EMSB's digital citizenship website, being real entails respect for the self and others; being safe involves being able to recognize fraud and being smart means being able to make good judgments when online. Mr. Dupraz's incorporated an interactive trivia-like review game on iPads called a "Kahoot" that engaged the students very much. During his next visit, the students will be exploring different topics related to digital citizenship such as phishing, cyberbullying, online safety, video game addictions and digital footprints. With the rise of social media, we can no longer afford not to prepare our students to be reflective of the trails they pave or the identities they weave both online and in real time. play chess. Students who do not know how to play chess can learn how to do so and can also borrow books about it from the library. Students can choose to play with a partner or to play online on laptops. As Mr. Amram expressed, chess enhances reading, memory, language and mathematical abilities. It also fosters critical thinking and increases the ability to focus and analyze concretely. This passion that is developed at school and open to anyone willing to try is often carried into adulthood. JOHN GRANT MURALS: Marie Francis, a teacher at John Grant High School in Côte Saint-Luc, says she wanted to get rid of the depressing “prison gray” walls in the building and instead brighten up the school hallways and do so in a creative way. John Grant is a high school in the EMSB that targets students who have academic struggles or who have mild to severe learning difficulties. It focuses on getting the students a Pre-Work Ministry Certification, instead of a high school diploma. Ms. Francis assigned 21 of her students to create a mural along the lockers and walls of the hallway on the third floor of John Grant. Her student teacher, Sinthia Cousineau, took charge of this project and worked alongside artist Marcio Melo. The John Grant mural project started was carried out February 13 to 15. Students were eager to work on this for three days and it built up their will to learn about the theme, aboriginal culture and art. Please read the full report here and see the video. Marie Francis and some students in front of their neat lockers. Students have fun in Quebec City. 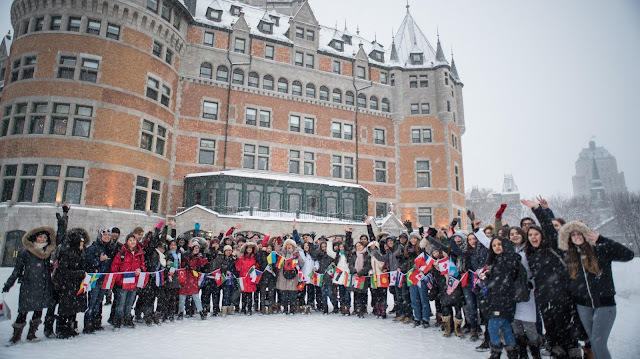 VISIT TO THE ICE HOTEL: The International Students Department organized a visit to the ICE HOTEL in Quebec City recently for 71 international students from 15 different countries such as Germany, Korea, China, Vietnam, Japan, Chile, Mexico, Hungary, Italy, Nigeria, Saudi Arabia, Brazil, Slovakia, Spain and Austria. 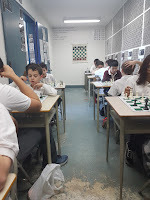 The participating schools included Marymount Academy International, Rosemount High School, John F. Kennedy High School, LaurenHill Academy, Lester B. Pearson High School and Westmount High School. Students had lots of fun, to see the entire photo album of their field trip check out their page: https://www.facebook.com/emsbint.students. CORONATION TOY DRIVE: With the children at Sainte-Justine Hospital in mind, Coronation Elementary School’s Kids for Social Change group recently organized a toy drive. The school community generously donated toys, figurines, dolls, puzzles and books. The gently used items were repaired by the students and sold, raising $430.50. 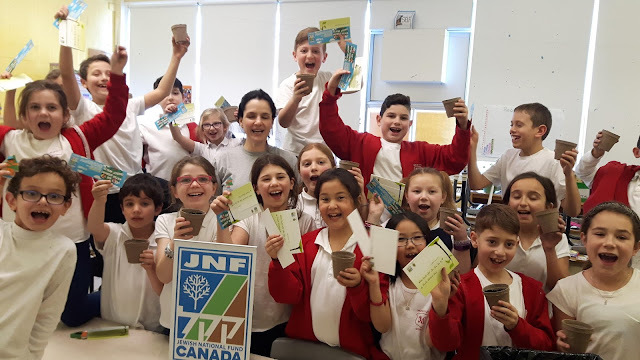 NEW YEAR FOR TREES: The Grade 3 PELO class of Merton Elementary School in Côte Saint-Luc celebrated the New Year for trees. Their teacher Gloria Stermer and the Jewish National Fund (JNF) Educational Emissary Noa Friedman facilitated the activity. They saw a video, played interactive games and learned about environmental responsibilities. Snacks of dried fruits were provided by the Home & School. 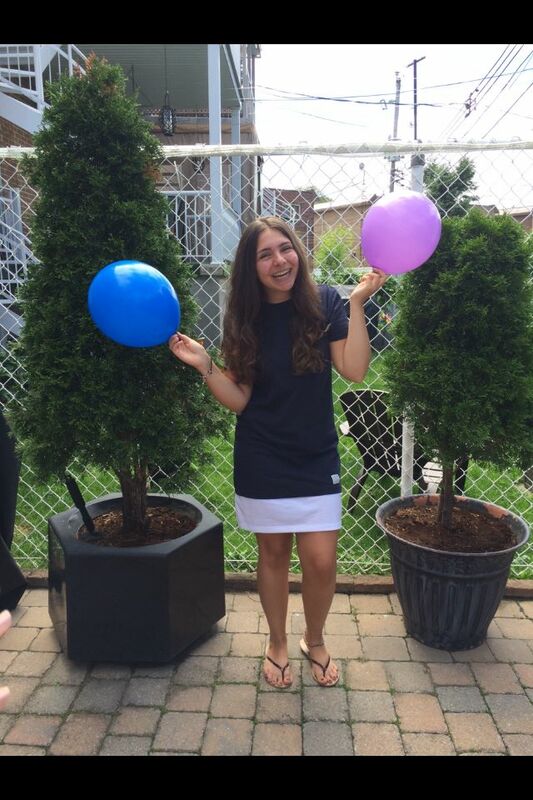 “The students had fun while learning about trees, fruits and Tikkun Olam,” said Merton PELO Coordinator Hanna Eliashiv. SPOKEN WORD HIT AT LMAC: Olivia Fusco, a Grade 11 student at Laurier Macdonald High School, never thought that she would become a viral sensation, let alone for her International Baccalaureate Personal Project. Yet, only days after posting her empowerment video on Facebook, she’s received over 60,000 views. The full video can be viewed here.The International Bacculaureate personal project is a long-term, student-centred project that is designed to focus on the students’ approaches to learning skills for self-management, research, communication, critical and creative thinking and collaboration. The personal project encourages students connect classroom learning engagements with personal experience, and to develop their own interests for lifelong learning. For her project, Olivia received guidance from her mentor, teacher Hugues Laplante. Since the beginning of the school year, they met on a monthly basis to craft a final message of inspiration and one that men and women of all ages can relate to and should pass along to younger generations. See this wonderful interview with her on Global TV's Focus Montreal. LMAC RELAY RACE: Laurier Macdonald High School in St. Léonard is partnering with L'École secondaire Antoine-De-Saint Exupery to run a relay race from Quebec City to Saint-Leonard, for Montreal’s 375th Anniversary. This relay race will take place at the end of May 2017. LMAC is creating a team of 50 students, 20 from Laurier Macdonald and 30 from Antoine-De-Saint Exupery, who will train together for the next few months, in both schools. This will allow students from both schools the opportunity to speak in their second languages, to exchange and interact with different cultures and backgrounds, and to learn more about accepting others. On Wednesday, May 24, the team and staff will board a bus that will take them to Quebec City. Once there, they will spend the day visiting museums and seeing the sitess the historical city has to offer. On Thursday, May 25, the race begins! Students will run two to five kilometres at a time, passing the baton to their teammates as they make their way from Quebec City to Montreal (running through Cap Rouge, St-Augustin, Neuville, Donnacona, Portneuf, Deschambault, Grondines, Ste-Anne-de-La-Perade, Bastican, Champlain, Ste-Marthe-Du-Cap, Cap de La Madelaine, Trois-Rivieres, Pointe Du Lac, Yamachiche, Louiseville, Maskinonge, Saint Barthelemy, Berthieville, Lanoraie, Lavaltrie, St-Sulpice, and Repentigny). The race will culminate on Friday, May 26 at about 2:30 in the afternoon at Wilfrid Bastien Park in Saint-Leonard, facing Antoine-De-Saint Exupery school. We will of course be celebrating with a VERY BIG party! This is a great opportunity to bring our Saint-Leonard community together. We are building links with a neighboring French school, welcoming senior students from the community elementary schools to run the last two kilometres together and celebrating Montreal’s 375th Anniversary together. ARCTIC VISITS: The Junior AAA St. Léonard Arctic made visits to Pierre de Coubertin and Honoré Mercier Elementary Schools during the month of February. This Sunday will be EMSB Day at Fleury Arena in Montreal North. The school visits are very popular, with the players delivering their "Stay in School" messages and playing a scrimmage. Free tickets to home games are distributed. Here are some photos from the Pierre de Coubertin visit. L’OR DU ROI MIDAS: More than 200 students from nine EMSB schools have lent their voices to L’Or du roi Midas, a children’s book and audio project that retells the ancient Greek myth of Midas’ Hellenic Community Centre of Greater Montreal on February 9 to debut three choral pieces from the CD. L’Or du roi Midas is a follow up project for music directors Dimitris Ilias and Maria Diamantis, as well as author and lyricist Glen Huser and composer Giannis Georgantelis. The four previously teamed up in the retelling of the myth of Demeter and Persephone in the picture book and CD, Le Temps des Fleurs, le temps des neiges. This project, like its predecessor, allows the children to discover the beautiful world of illustrations, learn how a professional CD is composed, from recording to mixing and editing, sing alongside a symphony orchestra all the while having fun building their self-esteem, team spirit and discipline. Upon completion, the final book and CD are sold and net profits are donated to the participating schools to strengthen music education and literary exploration in their curriculum. Rosario and Rosa Guzzo with Angela Mancini and Joe Ortona at the 2015 Parent Volunteer Night. VOLUNTEER NIGHT: The annual EMSB Parent Volunteer Appreciation Evening will take place on Tuesday, April 4 at the Crowne Plaza Hotel on Cote de Liesse. This year’s event is being held to commemorate National Volunteer Week, which runs from April 16 to 22, under the theme of Volunteers –Part of Our Heritage. Time and space do not allow the EMSB to honour all of its nearly 1,500 volunteers in person. Therefore, only those individuals who have volunteered for more than five years will attend the reception, representing some 500 people. However, several thousand copies of a commemorative program book will be distributed to each school. The emcees for the evening will be Global News senior anchor Jamie Orchard and EMSB Communications and Marketing Specialist Michael Cohen. For the eighth consecutive year, La Capitale Financial Services is the title sponsor for this event. La Capitale Financial Services, which is a member of La Capitale Financial Group, offers a wide range of products and services that are designed to simplify financial choices for members working in the public and parapublic sectors in over 900 public and parapublic institutions across the province. These services include: personal financial advice; savings, investments and funds; individual life and health insurance; mortgages and personal loans; insurance for automobiles, recreational vehicles, home, travel and legal access; commercial insurance; and group insurance. The Volunteers of Distinction this year are Rosario Guzzo and his late wife Rosa from Michelangelo International Elementary School in RDP. Rosa passed away in January. Rosario and his son will be on hand to accept the award. SPORTS AND WELLNESS GRANT: Kayla Segal recently returned to her former elementary school, Dunrae Gardens in Town of Mount Royal, recently to formally announce the establishment of the Kayla Segal Sports and Wellness Grant. Professionally Segal is a financial security advisor and independent life insurance broker. However, her passion remains competing in grueling triathlons across North America. In order to support health and wellness programs in the EMSB, she has now embarked upon an initiative to offer a grant of $1,000 to one elementary school and $1,000 to one high school in need of support to launch a physical activity or wellness related project. She has undertaken various fundraising activities to raise the money. Projects may be related to increasing opportunities for participation in physical activity, promoting good nutritional habits, addressing mental health issues via sport and/or other wellness topics. Applicants must be a member of the school community (staff member, parent, volunteer) and have the Principal’s support for grant application and implementation of the proposed project. Funds may be used to purchase equipment, materials and supplies, or hire outside personnel. For complete details go to http://www.emsb.qc.ca/sportsandwellnessgrant. Members of the Alouettes with EMSB Deputy Director General Angelo Marino, FACE Vice-Principal Frederic Boudreault and some students. ALOUETTES TOUR: The 20th anniversary of the community outreach program called Together at School with the Alouettes was marked on February 10 at FACE School downtown. During the course of the visit, players from the Montreal Alouettes football team addressed the students about the importance of academic perseverance and making good choices, while touching on other topics such as performance in school, consistency, peer pressure and self-esteem. The Alouettes players also took the time to sign autographs, take pictures and further engage with students. The Als have been active in Montreal schools since 1998. Together at School is a community outreach program supporting high school students in the greater Montreal area and it is now supported by the Alouettes Foundation. In 2016, the players visited 110 schools, reaching out to over 45,000 students. The main goal is to encourage kids to stay in school while focusing on a wide array of challenges that students face today, ranging from bullying and academic performance to peer pressure and the importance of staying active. The players look to inspire and motivate the students they meet to make the right choices and to reach their full potential through hard work and dedication. Five high schools (James Lyng, Royal Vale, Marymount Academy International, Laurier Macdonald and Vincent Massey), four alternative high schools (Options, Outreach, Focus and Vezina) and three elementary schools (East Hill, Edward Murphy and Gerald McShane) are part of the tour. 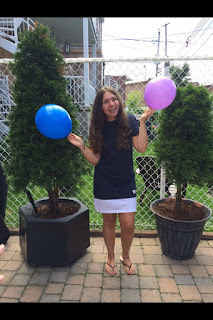 MACKAY CENTRE PROGRAM: Eleni Giannakis, a stagiare in the EMSB Communications and Marketing Division Office and present-day student at Rosemount Technology Centre, recently spent a day at the Mackay Centre School and posted this blog on the Reverse Integration Program. You can read it here. REGIONAL SCIENCE FAIR: The annual Hydro-Québec Montreal Regional Science & Technology Fair will take place Sunday, March 26, through Tuesday, March 28, on the downtown campus of Concordia University (1515 Ste. Catherine St. W). Organized by Educational Alliance for Science & Technology (EAST), in partnership with Concordia University, this is the third successive year that the Fair will be hosted at Concordia and a recent agreement now extends that through 2020. During this one-of-a-kind competition, budding scientists aged 13 to 20 will be presenting their scientific projects to visitors in creative and accessible ways that express their passion for science and technology. “At Concordia we encourage new ways of sharing what we know and getting people to think about how new knowledge and technological change impacts them,” says Justin Powlowski, interim vice-president of Research and Graduate Studies. “The students participating in the science fair are getting a taste of the whats, whys and hows of research, and that can set them on a path to catalyzing changes for the better in our world. I encourage everyone to visit the fair and see the work of these exceptional young researchers.” Hours open to the public are: March 26: 1 to 4 p.m.; March 27: 1 to 4 p.m.; March 28: 9 a.m. to 4 p.m. SPIRIT QUEST: On Thursday, April 20 students and Spiritual and Community Animators (SCA`s) and students of the EMSB will be taking part in an event aimed at visiting sacred spiritual sites and experiencing compassion in action in order to further develop their spiritual awareness. According to First Nations traditions, one goes on a Spirit Quest with the hope of experiencing an inner change, a healing, and an openness to others and to the divine. There will be a number of links to Earth Day, including celebration of First Nations’ traditions of caring for the earth and for one another, at the launching of the Spirit Quest. The third EMSB-SCA Spirit Quest will involve twelve schools - John F. Kennedy High School in St. Michel, John Paul I High School in St. Leonard, Laurier Macdonald High School in St. Leonard, Lester B. Pearson High School in Montreal North, Lauren Hill Academy Sr. and Jr. in St. Laurent, Marymount Academy International in Montreal, Rosemount High School in Rosemount, Royal Vale High School in NDG, Royal West Academy in Montreal West, Vincent Massey Collegiate in Rosemount and Westmount High School in Westmount. Hampstead students enjoy some fine food. HAMPSTEAD CELEBRATES DIVERSITY: Hampstead Elementary School held a week-long cultural celebration during which they marked and embraced the cultural diversity of our community. Interactive and exciting performances were held to educate students about different cultures including: the Buffalo Hat singers and hoop dancer Barbara Diabo (Aboriginal Day), the Chan Lion Dance Club (Chinese New Year), and Fusion Vibes (Bollywood day). Also included in the week was a virtual trip to meet and talk to students and teachers in Ghana (Black History). The week concluded with an International Food Festival. The community of staff, students and especially parents came together to provide a large array of international foods which made the event a tremendous success. HOOKED ON SCHOOL, LEARNING AND BRAIN BREAKS: From February 13 to 16, along with schools across the province, Hampstead held activities for School Perseverance Week, a time to really encourage our young students to love school and stay in school. The week kicked off with a student recognition assembly where we celebrated student effort, citizenship and leadership. As well, throughout the week, all students, teachers and parents contributed positive messages for our Encouragement and Success Bulletin Board. On February 14, not only did Hampstead School students celebrate Valentine’s Day by sending candy grams to teachers and friends, they marked the 100th day of school. Students were treated to a minion cupcake, while kindergarten and cycle 1 students held 100-day-themed games and activities throughout the day. Finally, after a visit to Forest Hill School in St. Lazare, Hampstead School was inspired to immediately begin to experiment with Energy, or brain break, stations around the school. When a student feels the need for a quick break from their work, they can ask for permission to take a 10-minute energy break at one of three stations: football/soccer, stationary bikes, or tennis. After 10 minutes of expending some energy, the student returns to class to continue their work. Currently, cycle 3 students are being trained to respect the equipment and their 10-minute time limit, but we hope to expand it to cycle 2 before the end of the school year, as well as installing more energy stations for 2017-2018. The Consul General is welcomed to the Centre. SPECIAL NEEDS PROGRAM LAUDED: Consul General for Italy in Montreal, Marco Riccardo Rusconi, recently visited Galileo Adult Education Centre. He did so in response to this article that was published in Panorama Magazine about the Centre's incredible program for special needs students. Consul General Rusconi wished to see the program for himself, and after a tour throughout the building walked away incredibly impressed by the students' knowledge and abilities. After meeting all the students and visiting their classes, he enjoyed a student-made lunch of pizza, pasta and a number of desserts. Principal Martina Schiavone ended the eventful day with a heartfelt speech thanking Dr. Rusconi and the Consolato Generale d’Italia Montreal for this special visit. She emphasized how at Galileo they truly are a caring family and how strongly they advocate a culture of inclusion and diversity. “Our students were so thrilled by the visit and were happy to exhibit their various skills and shed light on the program,” she said. Here are some photos. Students at the Marc Chagall exhibit. 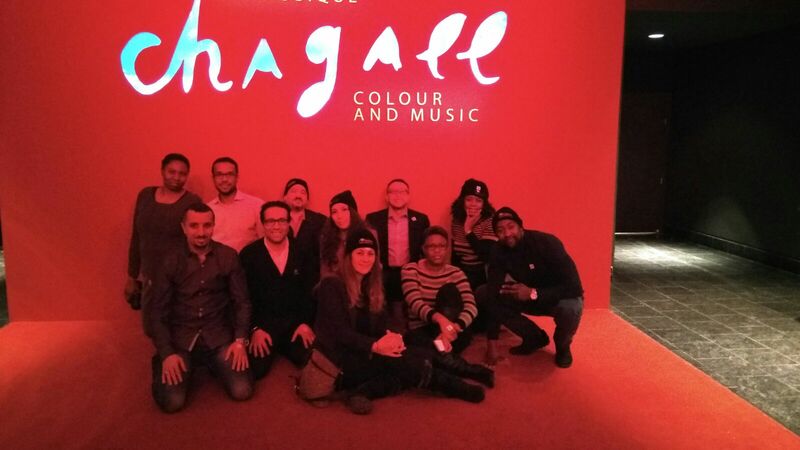 MUSEUM VISIT: On February 1, 105 Galileo students enjoyed an evening at the Museum of Fine Arts to witness the life of Marc Chagall, known as the artist without borders. Chagall Colour and Music is the largest Canadian exhibition ever devoted to Chagall. It was a feast of colour and artistic splendor for the 105 students, 99 percent of whom had never attended a museum exhibition. English and French second language students were introduced to an awakening of their senses by the wide variety of sculptures, films, slideshows, ceiling projections of murals and fantastical costumes for the stage. Students were immersed in the language of Art. They acquired new vocabulary during the tour as well as visiting part of history from around the world. As practioners of brain – based pedagogy, for three hours, teachers walked through the art halls and held mini discussions that had students captivated. Activities outside the classroom, such as the museum excursion, offer an opportunity to acquire subject specific terminology. Students were mesmerized by the volume of work and the sheer fun they had communicating and sharing stories that were inspired by the artwork. BOWLING ACTIVITY: On Friday February 3, over 290 Galileo students went bowling to Quilles 440, as part of the Winter Carnival festivities. Galileo’s commitment to an educational core curriculum that embraces social integration, physical fitness and brain –based pedagogy is part of instilling a healthy lifestyle philosophy. 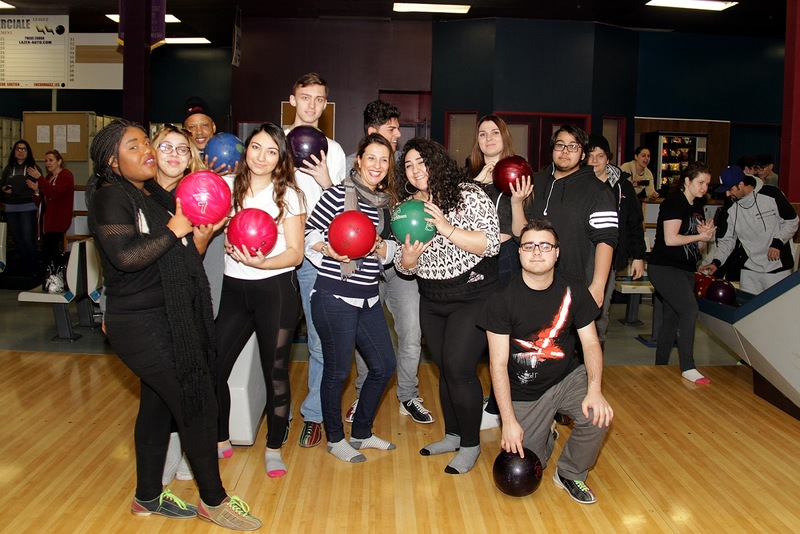 Students from the English and French second language programs were able to connect with academic students as well as joining the SIS special needs’ students in bowling. For most students it was their first time bowling and play was the language of the day. Students learning languages communicated with others with ease while acquiring new vocabulary specific to bowling. Students attaining social integration skills were interspersing with others while bowling and showing others how to bowl, all the while gaining self- confidence. Students completing a secondary school certificate were able to assist newcomers to Canada to understand the rules and regulations of bowling. All in all, learning in a social setting that centres on a physical activity, is an excellent form of education as indicated in the brain based pedagogical research practiced at Galileo. A very enjoyable educational experience was had by all students and faculty. THE BACHELOR CONTESTANT: Vanessa Grimaldi, a 29 year old special needs teacher at the Galileo Adult Education Centre, is one of the contestants on ABC’s top-rated reality TV program The Bachelor. On the most recent episode, seen by millions of viewers,Vanessa brought bachelor Nick Viall for a hometown date. Nick flew to Montreal for a hometown date with Vanessa. Vanessa is a special educator teacher in the adult sector, which means all of her students are over 21. That morning, they went to her classroom to meet them, and they had all made posters and cried when they reunited with her. It was very adorable and Vanessa is basically perfect. We’re not crying, you’re crying.Because Vanessa’s parents are divorced, Nick met her mother and father separately. First, he met her mom and the rest of the family, which consisted of a giant group of Vanessa’s siblings, aunts, uncles, cousins, grandparents and friends.Things started to get a little iffy at lunch when someone asked Nick whether he and Vanessa had talked about where they might move after the show was over and it quickly became obvious that Nick and Vanessa hadn’t talked about that — or the other logistics that need to be discussed before an engagement — at all. Between an awkward conversation with Vanessa’s mom(the Laurier Macdonald Career Centre Academic Advisor Mary Mercuri) followed swiftly by her sister plainly stating to Nick’s face that she would “hate” him if he broke Vanessa’s heart, things got pretty tense. Throughout the evening, Nick cried, Vanessa cried and quite a few of Vanessa’s family members cried, too. You can read the entire article here. The Bachelor airs Mondays (8 p.m. ET) on ABC. TOOLS FOR TEACHERS: Éducaloi is a non-profit organization that informs Quebecers about the law by providing legal information in everyday language. Very active in schools, we create tools for teachers to talk about the law with students. The have some new guides for adult education teachers. We know that real-life situations are often the entry points for adult education. The law is part of everyday life, even when we don’t realize it. Their free guides suggest teaching activities that make links between our legal information and courses in Quebec’s adult education curriculum. Each guide has a teacher and student version available in SMART Notebook form for whiteboards, or as a PDF.You can learn more about the guides or download them at www.educaloi.qc.ca/adulted. Valentine's Day spirit at Pius. LOVE IS IN THE AIR: On February 14, the computer graphics teachers of Sr. Pius X Culinary Institute and Business Centre put their lessons aside and spent time integrating their international students to Canadian culture and Valentine’s Day. One teacher dressed as Cupid and others, wearing red tutus, went around the school spreading Valentine cheer and chocolates! The students were delighted that their teachers took the time to discuss the meaning of this annual tradition—they too joined in the excitement of this special day dedicated to love. Great initiative—a little sample of culture mixed in their daily study routine goes a long way for Pius students! MEILLEUR TAUX DE RÉUSSITE À LA CSEM: Pour la troisième année consécutive, la Commission scolaire English-Montréal enregistre le taux de réussite le plus élevé parmi les commissions scolaires publiques à la grandeur de la province de Québec, comme en témoignent les données publiées par le ministère de l’Éducation et de l'Enseignement supérieur (MEES). Le taux de 89,4 % est basé sur une cohorte de sept ans. Il regroupe le taux de diplomation du secondaire durant cette période et le taux de certification des élèves du parcours de formation axée sur l’emploi. Il reflète la progression des élèves de 2008 jusqu’à leur diplomation en 2015. Il s’agit d’une hausse par rapport au taux de 87,9 % obtenu l’an dernier. Dans le cadre de sa convention de partenariat avec le ministère, la CSEM s’était fixé un objectif de 86 % pour la classe de finissants de 2016 et de 88 % pour celle de 2020. « Or, nous avons dépassé cette cible de même que l’objectif pour 2020 », a fièrement déclaré Sandra Furfaro, directrice des Services éducatifs et de la technologie de la CSEM. Pour mettre en perspective les taux de réussite actuels des élèves de la CSEM, mentionnons que le taux de réussite moyen parmi toutes les écoles québécoises (publiques et privées) est de 78,8 %, tandis qu’il se situe à 74,9 % pour les écoles publiques seulement. Pour obtenir la liste complète des résultats de chacune des commissions scolaires de la province, veuillez consulter le site Web de la CSEM au www.emsb.qc.ca. DIRECTRICE EXCEPTIONNELLE: Anna Sanalitro, directrice de l’école primaire Pierre Elliott Trudeau de la CSEM à Rosemont, est l’une des deux récipiendaires au Québec de la désignation de directrice exceptionnelle du Canada décernée par Partenariat en Éducation. Depuis maintenant 13 ans, le programme des directeurs et directrices exceptionnels du Canada de Partenariat en Éducation souligne la contribution unique et vitale des directions d’écoles publiques. Les candidatures de 40 directrices et directeurs d’école présentées par des parents, des collègues et des membres de la communauté sont soumises à un comité national de sélection. L’objectif vise à célébrer l’innovation, le leadership et la créativité démontrés par les directions d’école dans leur quête de solutions et d’occasions au sein de leur communauté scolaire. Les récipiendaires seront honorés lors du gala annuel des directeurs et directrices exceptionnels du Canada qui se tiendra le 28 février prochain au Centre Sheraton de Toronto. L’autre récipiendaire de cet honneur au Québec est Mary Lazaris, directrice de l’école primaire Twin Oaks à Laval. Anna Sanalitro a été enseignante, conseillère en mathématiques et administratrice aux niveaux primaire et secondaire. En 2014, elle est devenue directrice de l’école Pierre Elliott Trudeau, un établissement où les besoins des élèves sont fort variés. Elle a d’abord recueilli les commentaires de tous les intervenants et leur a demandé de prendre part au processus de changement. Elle a mis à profit son savoir-faire en centrant ses efforts sur le programme STIAM (sciences, technologies, ingénierie, arts et mathématiques). Elle a procédé à une mise à niveau de la technologie en place à l’école, a supprimé les obstacles à la collaboration et a mis sur pied deux classes axées sur le développement social, émotionnel et scolaire. Des mesures de soutien ont également été prises dans le but de maximiser les occasions d’apprentissage chez les élèves ayant des besoins particuliers. Mme Sanalitro a misé sur l’accélération en tant qu’approche pour appuyer les élèves sous-performants et a encouragé l’utilisation d’une classe en plein air en vue d’offrir aux élèves des expériences d’apprentissage authentiques, avec la collaboration de bénévoles au sein de la communauté. Aussi n’est-il pas surprenant de constater que le nombre d’inscriptions et le rendement scolaire se sont accrus sous sa direction. Nous vous invitons à consulter l’intégral du communiqué de presse. B.A.S.E. ET STIAM: Le programme de services de garde enrichis B.A.S.E. (avant et après les heures de classe) est un complément au projet éducatif des écoles. Aussi, lorsqu’une école estime être une école STIAM, le programme B.A.S.E. sur place offre alors aux élèves des activités parascolaires qui cadrent avec le modèle STIAM. Le programme de services de garde B.A.S.E. a fait appel à Sara Iatauro, conseillère en sciences, technologies et robotique dans les écoles primaires de la CSEM pour qu’elle anime, en décembre 2016, des ateliers Lego We Do destinés aux éducatrices en services de garde B.A.S.E. à l’école Général Vanier. Depuis, les élèves en services de garde de tous âges participent au programme de robotique des services de garde, et ce, sur une base hebdomadaire et lors des journées pédagogiques. MOIS DE L’HISTOIRE DES NOIRS: Pour souligner le Mois de l’histoire des Noirs en février à la CSEM, le rappeur Annakin Slayd a animé dans certaines écoles une série d’exposés sur le légendaire joueur de baseball Jackie Robinson et sur la ville de Montréal. Jackie Robinson est celui qui a fait tomber la barrière de la couleur dans le baseball professionnel. Annakin Slayd est le nom de scène d’Andrew Farrar qui a grandi à Chomedey et est diplômé de l’école secondaire Western Laval en 1995. Il a collaboré, en 2011, à la campagne marketing « Go Publique » avec l'Association des commissions scolaires anglophones du Québec où il a produit et dirigé une vidéo musicale, et en a été la vedette, dans le but de faire augmenter le nombre d’inscriptions. À chacune des écoles qu’il a visitée, Annakin a présenté un exposé d’environ 50 minutes comportant trois volets et dont le point culminant fut le visionnement du reportage produit par la chaîne télévisée PBS Mountainview « Jackie Robinson’s Montreal Connection » ainsi que sa vidéo à succès avec la chanteuse Leesa Mackey. Il a également présenté des photos et des vidéos de Jackie Robinson, souligné ses réalisations dans le monde du baseball et au sein du mouvement en faveur des droits civiques, s’est penché aussi sur son passage à Montréal et son héritage qui perdure encore aujourd’hui dans la métropole. Il s’est entretenu sur la perception de la tradition d’accueillir d’autres athlètes dit rejetés, tels John Carlos et Michael Sam, dans l’univers du sport. Il a visité le Centre d’éducation des adultes St-Laurent ainsi que les écoles suivantes : Cedarcrest, Parkdale, Dalkeith, l’école secondaire John F. Kennedy, l’Académie Royal West et l’Académie LaurenHill. Il est disponible pour animer d’autres exposés. 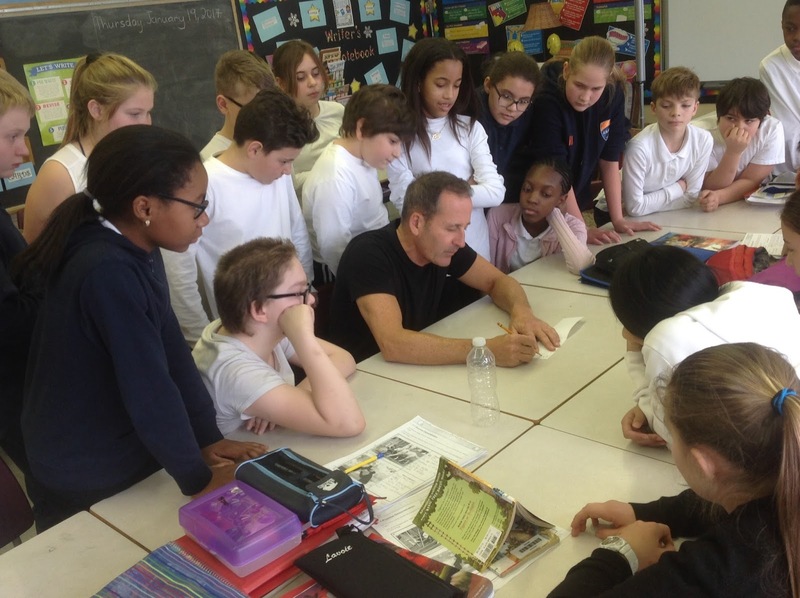 MOIS DE L’HISTOIRE AUTOCHTONE : Le Chef Top Leaf a rendu visite récemment aux élèves de l’école primaire St-Gabriel à Pointe Saint-Charles pour leur parler du patrimoine autochtone dans le cadre de la Semaine de l’histoire autochtone. À l’aide d’histoires et de plusieurs magnifiques artéfacts, il a expliqué aux jeunes comment les peuples autochtones vivaient il y a plus de 500 ans. « Les élèves ont démontré une grande curiosité et ont posé une foule de questions portant sur les traditions des Mohawks », a déclaré Veronica D’Agata, animatrice de vie spirituelle et d’engagement communautaire. « Découvrir les contributions des populations autochtones à notre société fut une expérience fort enrichissante. C’est une belle façon d’apprécier notre patrimoine canadien et de prendre conscience de la diversité des communautés qui forment le Canada ». LES DANGERS LIÉS À LA TOXICOMANIE: Le 14 février dernier, l’école secondaire Rosemont a accueilli l’ancien joueur de football de la NFL, Alvin Powell, qui s’est entretenu avec les élèves des dangers de la toxicomanie. M. Powell, qui a joué pour les Seahawks de Seattle et les Dolphins de Miami, a raconté son histoire, à commencer par son enfance, puis son ascension au sein du football professionnel et, éventuellement, ses déboires avec la marijuana, la cocaïne et l’alcool, qui l’ont amené à perdre le contrôle de sa vie. Le point culminant de son exposé fut sans contredit lorsqu’il expliqua avec une vive émotion comment il a failli s’enlever la vie et que n’eût été de la personne qui, un jour, lui a tendu la main, il ne serait pas ici aujourd’hui pour en parler. C’est d’ailleurs la mission qu’il accomplit maintenant auprès des jeunes. À en juger par le silence qui a régné tout au long de la présentation, les élèves ont été captivés par l’histoire mouvementée de M. Powell. À la fin de son exposé, il a accepté de répondre aux questions des élèves et de se prêter à une séance de photos. Depuis l’an 2000, M. Powell voyage et présente des conférences pour le compte de la Fondation Saving Station, un organisme de bienfaisance montréalais dont la mission vise la prévention et l’éducation en matière de toxicomanie. LA JOURNÉE DU CHANDAIL ROSE (PINK SHIRT DAY): La 5e édition de la Journée du chandail rose a eu lieu au Collège Vincent Massey à Rosemont le vendredi 17 février. À cette occasion, tous ont été invités à porter du rose en guise de solidarité contre l’intimidation dans les écoles. Cette tradition a vu le jour au CVM en 2012. Le conférencier invité, Wali Shah (https://www.walifloshah.com), l’un des lauréats du prix Top 20 Under 20 en 2014, est un populaire orateur et poète canadien. Il étudie présentement à l’Université de Toronto et puise son inspiration dans les enjeux sociaux, ses expériences personnelles, la comédie et ses origines sud-asiatiques et musulmanes. Les élèves et les enseignants se sont vu remettre un t-shirt rose, création des élèves eux-mêmes. Le thème choisi cette année est Pink it forward. FUSILLADE TRAGIQUE: La CSEM a condamné l’acte terroriste survenu à Québec. « Nous avons offert nos plus sincères condoléances aux familles touchées par ce drame », a déclaré Angela Mancini, présidente de la CSEM. « Nous sommes solidaires avec la communauté musulmane ». CITOYENNETÉ NUMÉRIQUE : Sous la direction de François Dupraz, conseiller en TI à la CSEM, les élèves de 5e année de l’école Royal Vale ont pu explorer le concept de la citoyenneté numérique. Ils ont discuté de ce que signifie être un citoyen et un citoyen numérique. Ils ont parlé de l’importance d’être « authentique, prudent et intelligent » lorsqu’ils sont en ligne. Tel qu’on peut le lire sur le site Web de la CSEM, la notion d’authenticité repose sur le respect de soi et d’autrui; la prudence suppose qu’on est en mesure de reconnaître les fraudes et la notion d’intelligence signifie qu’on doit faire preuve de bon jugement lorsqu’on est en ligne. M. Dupraz a incorporé un jeu-questionnaire interactif aux tablettes iPad intitulé Kahoot qui interpelle grandement les élèves. Lors de sa prochaine visite, les élèves exploreront divers thèmes en lien avec la citoyenneté numérique, notamment l’hameçonnage, la cyberintimidation, la sécurité en ligne, la dépendance aux jeux vidéo et l’empreinte numérique. Devant la popularité croissante des médias sociaux, nous devons à tout prix sensibiliser les élèves aux traces qu’ils laissent derrière eux et aux identités qu’ils bâtissent aussi bien en ligne qu’en temps réel. L’OR DU ROI MIDAS: Plus de 200 élèves provenant de 9 écoles de la CSEM ont prêté leur voix à L’Or du roi Midas, un projet de livre avec CD audio pour enfants qui raconte l’histoire de l’ancien mythe grec du roi Midas. Ces élèves, en compagnie de camarades provenant de 11 autres écoles locales, se sont réunis au Centre communautaire hellénique de Montréal le 9 février dernier pour interpréter 3 pièces chorales du CD. L’Or du roi Midas constitue un deuxième projet pour les directeurs musicaux Dimitris Ilias et Maria Diamantis, de même que pour l’auteur et parolier Glen Huser et le compositeur Giannis Georgantelis. Ce quatuor avait précédemment collaboré à la réalisation du livre illustré et du CD Le Temps des Fleurs, le temps des neiges qui racontent l’histoire du mythe de Déméter et Perséphone. Ce projet, tout comme le précédent, permet aux jeunes de découvrir le merveilleux monde de l’illustration, d’apprendre comment est produit un CD professionnel – de l’enregistrement au mixage en passant par le montage –, de chanter accompagnés d’un orchestre symphonique, et ce, tout en s’amusant et en développant leur estime de soi, l’esprit d’équipe et la discipline. Une fois terminés, le livre et le CD sont vendus et les bénéfices nets de la vente sont versés aux écoles participantes dans le but de renforcer l’enseignement musical et la littératie au sein de leur curriculum. SOIRÉE DES BÉNÉVOLES: La Soirée annuelle d’appréciation des parents bénévoles à la CSEM aura lieu le mardi 4 avril à l’Hôtel Crowne Plaza, sur le chemin de la Côte-de-Liesse. L’édition de cette année vise à commémorer la Semaine de l’action bénévole qui se déroulera du 16 au 22 avril, sous le thème « Bénévoles : Créateurs de richesses ». Faute de temps et d’espace, la CSEM est incapable d’honorer en personne ses quelque 1 500 bénévoles. Par conséquent, seuls ceux qui œuvrent à titre de bénévoles depuis plus de cinq ans seront conviés à cette réception, soit environ 500 personnes. Toutefois, plusieurs milliers d’exemplaires du programme commémoratif seront distribués dans toutes les écoles. Les maîtres de cérémonie de la soirée seront Jamie Orchard, chef d’antenne à Global News, et Michael Cohen, spécialiste en communications et marketing à la CSEM. Pour la 8e année consécutive, les Services financiers La Capitale sera le commanditaire principal de l’événement. Les Services financiers La Capitale (www.lacapitale.com), membre du Groupe financier La Capitale, offre une vaste gamme de produits et services conçus pour simplifier les choix financiers des membres qui œuvrent dans les secteurs publics et parapublics, dans plus de 900 institutions à la grandeur de la province. Au nombre des services offerts figurent les conseils financiers personnels, l’épargne, les placements, l’assurance vie et santé, les hypothèques et prêts personnels, l’assurance automobile et l’assurance pour véhicules récréatifs, l’assurance habitation, l’assurance voyage et la protection juridique, l’assurance commerciale et l’assurance collective. Cette année, les bénévoles émérites sont Rosario Guzzo et sa défunte épouse Rosa de l’Académie Leonardo Da Vinci à Rivière-des-Prairies. Rosa est décédée en janvier. Rosario et son fils seront présents pour recevoir cet honneur. BOURSE POUR LE SPORT ET LE MIEUX-ÊTRE: Kayla Segal était récemment de passage dans son ancienne école primaire, Dunrae Gardens à Ville Mont-Royal, afin d’annoncer officiellement la création de la Bourse Kayla Segal pour le sport et le mieux-être. Mme Segal est conseillère en sécurité financière et courtière indépendante en assurance vie. Toutefois, sa véritable passion l’amène à prendre part à d’éreintants triathlons partout en Amérique du Nord. Dans le but d’appuyer les programmes axés sur la santé et le mieux-être à la CSEM, elle a lancé une initiative visant à octroyer deux bourses, soit 1 000 $ à une école primaire et 1 000 $ à une école secondaire pour les aider à mettre sur pied un projet lié à l’activité physique ou au mieux-être. Elle a organisé diverses activités de financement pour amasser ces fonds. Les projets proposés doivent encourager une pratique accrue de l’activité physique, promouvoir de saines habitudes alimentaires, aborder les problèmes de santé mentale par le sport ou porter sur d’autres sujets liés au mieux-être. La candidature doit être présentée par un membre de la communauté scolaire (employé, parent, bénévole) et la direction doit donner son appui à l’affectation des fonds et à la mise en œuvre du projet proposé. Les fonds pourront servir à l’achat d’équipement, de matériel et de fournitures ou à l’embauche de personnel externe. Pour en savoir davantage, visitez le http://www.emsb.qc.ca/sportsandwellnessgrant/. COURSE À RELAIS LMAC : L’école secondaire Laurier Macdonald (LMAC) à Saint-Léonard fait équipe avec l’école secondaire Antoine-de-Saint-Exupéry afin de prendre part à une course à relais entre la ville de Québec et Saint-Léonard, dans le cadre du 375e anniversaire de Montréal. Cette course aura lieu à la fin du mois de mai 2017. LMAC est à former une équipe de 50 élèves, soit 20 qui proviendront de l’école Laurier Macdonald et 30, de l’école Antoine-de-Saint-Exupéry. Ces élèves s’entraîneront tous ensemble au cours des prochains mois, dans les deux écoles. Ils auront l’occasion de s’exprimer dans leur langue seconde, d’échanger et d’interagir avec des élèves de différentes cultures et origines, et d’apprendre à accepter les autres. Le mercredi 24 mai, l’équipe de coureurs et le personnel se rendront en autobus à Québec. À leur arrivée, ils visiteront des musées et les sites historiques qu’on y retrouve. La course aura lieu le lendemain, soit le jeudi 25 mai. Les élèves courront 2 à 5 km à la fois, passant le témoin à leur coéquipiers tout au long du parcours qui les mènera de Québec à Montréal (ils traverseront les municipalités suivantes : Cap-Rouge, Saint-Augustin, Neuville, Donnacona, Portneuf, Deschambault, Grondines, Sainte-Anne-de-la-Pérade, Bastican, Champlain, Sainte-Marthe-du-Cap, Cap-de-la-Madeleine, Trois-Rivières, Pointe-du-Lac, Yamachiche, Louiseville, Maskinongé, Saint-Barthélémy, Berthieville, Lanoraie, Lavaltrie, Saint-Sulpice et Repentigny). La course atteindra son point culminant le vendredi 26 mai vers 14 h 30 au parc Wilfrid-Bastien à Saint-Léonard, situé en face de l’école Antoine-de-Saint-Exupéry. Il va sans dire qu’une IMMENSE fête est prévue pour célébrer la fin de cette course! Ce sera là une belle occasion de réunir toute la communauté de Saint-Léonard. Nous sommes à créer des liens avec une école francophone avoisinante et nous invitons les élèves des écoles primaires de la communauté à venir courir les deux derniers kilomètres avec nous et à célébrer le 375e anniversaire de Montréal. DES ÉLOGES À L’ENDROIT D’UN PROGRAMME DESTINÉ AUX ÉLÈVES AYANT DES BESOINS PARTICULIERS: Marco Riccardo Rusconi, consul général de l’Italie à Montréal, a récemment rendu visite au Centre d’éducation des adultes Galiléo suite à la parution d’un article dans la revue Panorama mettant en vedette le remarquable programme qu’offre le Centre aux élèves ayant des besoins particuliers. Désireux de voir par lui-même ce programme et au terme de sa tournée du Centre, il s’est dit extrêmement impressionné par les connaissances et les habiletés des élèves. Après avoir rencontré tous les élèves et visité leurs classes, Dr Rusconi a dégusté un lunch composé de pizza, de pâtes et de desserts préparés par les élèves. La directrice Martina Schiavone a clôturé cette journée bien remplie en prononçant un discours sincère dans lequel elle a tenu à remercier Dr Rusconi et le Consulat général de l’Italie à Montréal pour cette visite bien spéciale. Elle a insisté sur le fait que le centre Galileo est une véritable grande famille attentionnée qui préconise une culture d’inclusion et de diversité. « Nos élèves ont été enchantés de cette visite et heureux de pouvoir démontrer leurs multiples aptitudes et mettre en lumière ce programme », a-t-elle déclaré. The next Focus will be published on March 30. Submissions should be made to Michael J. Cohen preferably by e-mail (mcohen@emsb.qc.ca) by March 24 at Noon.